No Irishman should be without his/her Leprechaun on St.Patrick's day! Here he comes to the rescue with his pot of gold and long flowing auburn beard. 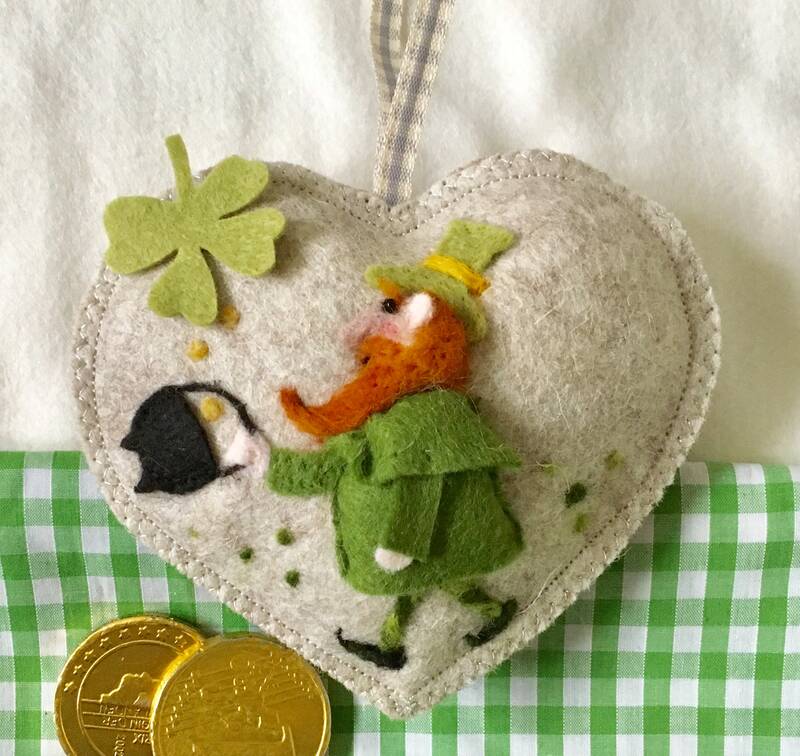 Needle felted sculpture on a felt heart with a good luck four leaf clover made with 100% sheeps wool by hand in my studio here in Somerset. approximately 12 x 12 cm in size. 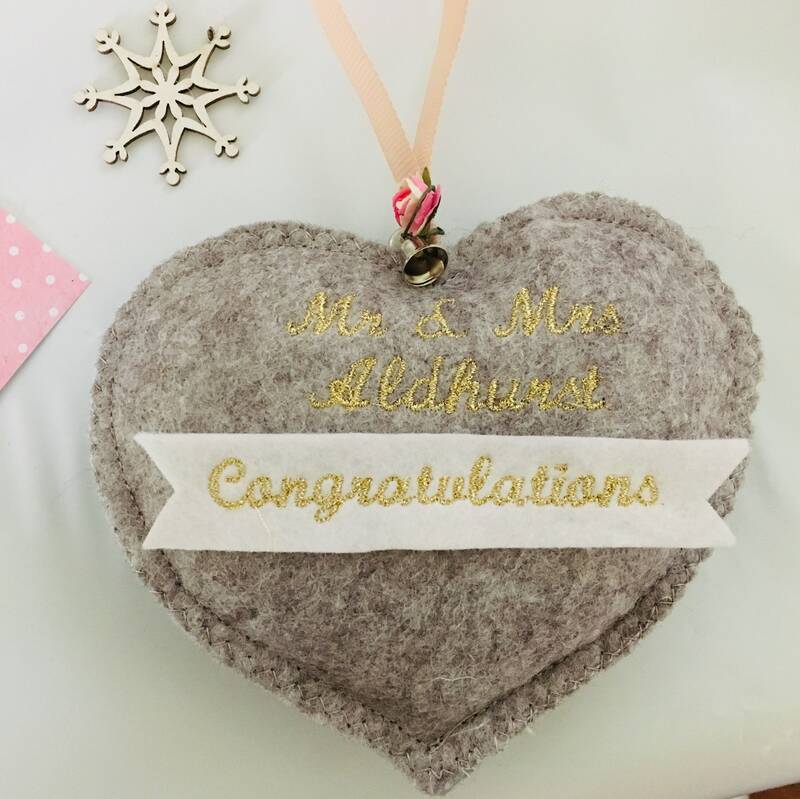 Names and dates can also be embroidered under the pocket on the back of the heart. I make all hearts on demand so let me know which scent you would prefer. ( lavender or cinnamon) and just drop me a note with the name if required. I am ready to ship him in three to four days. All intellectual property in my products, designs and on this website are and will remain the property of Liberty Bishop. Any infringement of these rights will be pursued seriously. From the time I receive an order and payment I send the item within 4-5 days, however if you are in a hurry I am happy to speed up my end too! If you wish to cancel an order please inform me before I have sent it, otherwise postage will be charged. I use the Royal Mail postal system and larger orders items are automatically insured. Please request insurance if you would like to on smaller orders of under $30. I shall let you know as soon as your item is posted. To Europe delivery is usually 4-5 days. To America normally 2 weeks and Elsewhere also around 2 weeks. I will accept returns as long as the item returns undamaged. In such circumstances I refund the cost of the item but not the postage.